Bad Dog Food List - Avoid The Worst Commercial Dog Food Brands on the Market! Here, you will find our Bad Dog Food List. These commercial dog food brands are, in our opinion, the worst dog foods on the market! We give them a disgusted 0 Scoops! Our personal recommendation is that you take a good look at these dog food names and memorize them. Now! Tuck your tail between your legs and run for the hills! See here for a glimpse of what really goes on behind the commercial dog food industry. These dog foods contain the worst dog food ingredients you will find! They are comprised mainly of by-products; carcinogenic flavors and preservatives; cheap, unhealthy fillers, and ... Heaven only knows what else! In addition, we have no respect for the philosophy of these pet food companies. In our opinion, they are clearly dedicated to their bottom line with a total disregard for the health and well-being of our beloved furry companions. 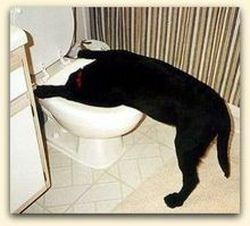 They are truly a far cry from the best dog foods available! It is highly unlikely that any of these awful supermarket brands on our list of Bad Dog Foods will be carried or recommended by any respectable, independent dog food store. Worst Dog Food Rating - Zero Scoops!